If you're energy seems to drain quickly, you could have a magnesium deficiency. Magnesium is involved in more than 300 biochemical reactions in your system and plays a core role in energy production. Legumes like peas, beans and peanuts are the best sources of magnesium, and can help you fulfill the recommended daily allowance of 320 milligrams, according to ABC News. When you exercise, it will be especially critical to consume legumes, as magnesium gets redistributed to get energy molecules where they're needed. 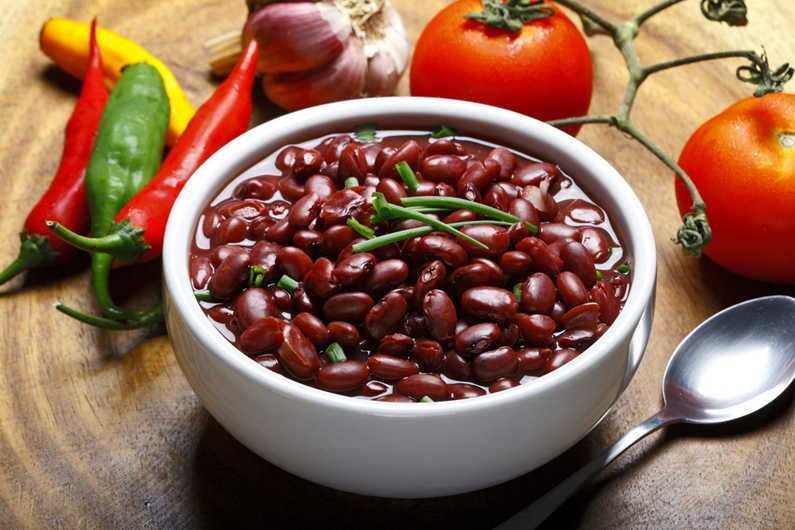 Legumes like beans can benefit energy production. Eating fruits and vegetables has always been advised for a healthy lifestyle, but these foods can actually help improve your happiness as well. Studies have found that those eating fruits and veggies every day have a higher likelihood to be classified as being "very happy", Care2 reported. In fact, those who got up to seven or eight servings a day reported the highest satisfaction and happiness. This likely occurs because these foods contain higher levels of vitamin C, which contributes to the production of dopamine. Fruits and veggies can also reduce inflammation, contribute to greater creativity and inspire more intense feelings of curiosity, producing a higher level of wellbeing. "Salmon delivers EPD and DHA, which can boost your mood." Salmon is a great protein that could be used for meals or as part of a snack. The fish is packed with omega-3 fatty acids, which are essential when your brain needs a boost, according to Today. In addition, salmon delivers EPD and DHA, which can boost your mood, lower irritability and decrease stress. Pairing the healthy fats of salmon with carbohydrates in whole grains will help you get quick and long-lasting energy. So next time you're reaching for a snack at work, consider salmon on toast as a potential option to get you through the day. If you're striving to boost your metabolism, cut down fat and build muscle mass, using lean proteins in your meals will be the best option. Chicken, turkey breast, egg whites and seafood all have the potential to be used to stimulate cellular activity that burns excess fats and aids metabolic processes, The Daily Meal stated. The best part is that these proteins can be used in a number of ways and can be paired with other foods to accelerate weight loss. Using lean proteins alongside calcium sources will help break down fat found in cells and contribute to a healthier, sustainable diet. When shopping and planning out your meals for the week, it can be easy to reach for processed and frozen foods. Your body will directly benefit based on the foods that are put into it. These foods can help improve your health and can be used in a wide variety of ways, giving endless possibilities to boost your wellbeing.